Dwana Smallwood, Alvin Ailey American Dance Theater alumni and creator of the Oprah Winfrey Leadership Academy Dance Company, hired Katy Dwyer Design to design a logo for her new Performing Arts Center in Brooklyn, NY. From the first round of logos KDD designed, Dwana found an instant winner, and the brand was born. We then designed and produced the business cards and stationery. Dwana also needed a website that was unique. Since Dwana was so happy with the other work that was done, she decided to hire KDD to create this for her. We designed a custom-built, fully-responsive WordPress website, complete with donation links, the ability to integrate with the center’s class registration portal, a blog, galleries, and more. 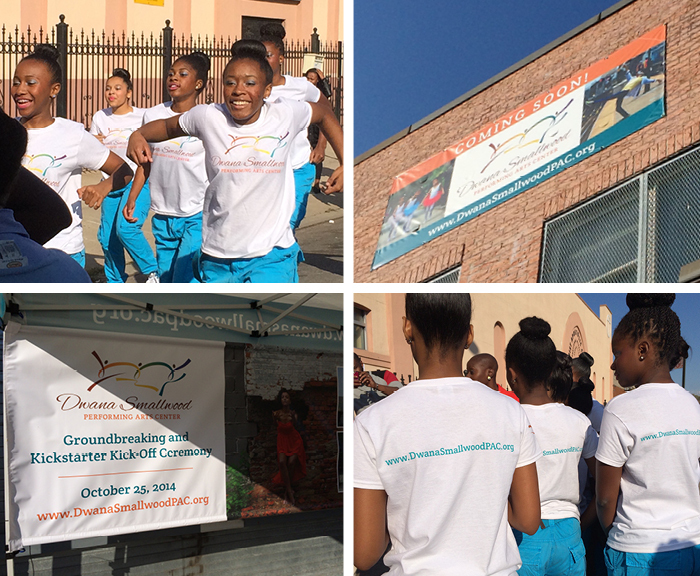 KDD also designed and produced postcards, outdoor banners, and 6-color-imprint t-shirts for the Performing Arts Center dancers. Since Dwana’s Center has opened, her need for other things like social media graphics, updates to her website, and additional apparel have grown. She continues to come back to Katy Dwyer Design for that work.